This Palmetto style 1347AF PTFE-impregnated synthetic compression packing seal with a petroleum-based lubricant protects pumps and valves from fluid leaks in general service applications. 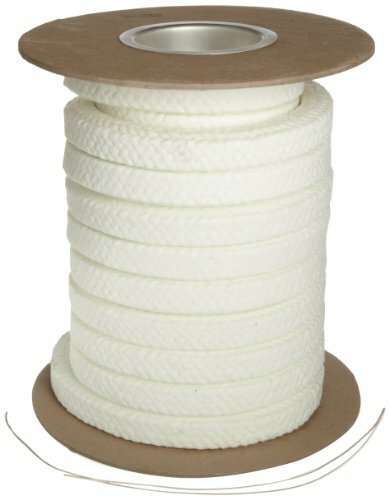 The interwoven braided packing seal is made of soft, flexible acrylic (Syn-Tex) yarn impregnated with a fifty-percent dispersion of virgin polytetrafluoroethylene (PTFE). PTFE fills gaps in the braid to improve sealing and protect the packing from harsh chemicals, including solvents, acids, bases, and strong oxidizers. Its low coefficient of friction reduces shaft wear by minimizing drag and heat buildup between the packing and the shaft or stem. The packing is saturated with a petroleum-based break-in lubricant that provides lubrication and sealing at initial start up to prevent overheating and glazing. It also reduces the need for frequent adjustments during break-in. The packing is non-contaminating and non-staining. This packing seal is compatible with media in the pH range of 2-12, has a maximum pressure limit of 1,500 pounds per square inch (psi), a pressure-velocity (PV) factor of 335,000, and a shaft speed of 2,300 feet per minute (fpm). It operates at temperatures from -10 to 450 degrees F (-23 to 232 degrees C). Style 1347AF is suitable for use in equipment such as centrifugal pumps, mixers, blenders, agitators, and knife gate valves, among others.